Small / Medium - $24.99 Only 2 left! Imagine how great it would be to have the magical powers of a genie—especially if you didn’t have a pesky master hanging around, always demanding things from you. The world would be your oyster! You could wish yourself all sorts of great things… like wishing the house was clean without ever leaving your couch. Or wishing that the chip bowl was never empty. Or wishing that you could slip into the “10 Items or Fewer” line even though you really have 11 items. Truly that would be the perfect life, if mosquitoes would leave you alone while on camping trips and your toast would never be burned. We can’t think of anything—anything at all—that it would be better to wish for you if you had a genie’s powers. Unfortunately, it’s pretty unlikely that you’re going to crash land onto a tropical island and find a genie’s magical lamp on the sand. But if you can’t find your own personal genie, you can at least dress like one with this Women’s Dreamy Genie Costume. 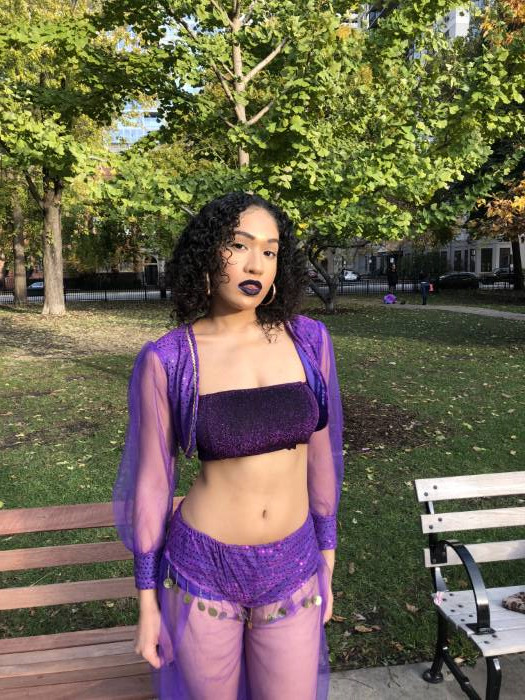 The stylish purple outfit includes a belly shirt and long-sleeved jacket with sequin decorative detail, as well as sheer purple harem pants that come with built-in underwear and a sequin waistband with gold coin accents. To top everything off, a matching purple hat with sheer veil is included. Armed with the Women’s Dreamy Genie Costume, you’ll be ready to grant wishes in no time! Costume is amazing but the quality is very flimsy and ripped as soon as I put it on.